To Doc Tabia and BB games chairman. These is just a suggestion, is it too late to get our oldtimer to play a game for the opener or anytime available. It will be a lot of fun, have Dante V, you ,Tuwad, Pabling to form 2 squad to play a game. I think you guys can swing it.I'll be glad to give donation, to help out the BB chair, i know Simeon is one of them. thank you, this is not only to reminisce the good ol days but to acknoledge the good players of the past.like the Caidic brothers etc. etc. Thank you for your interest. I will ask Simeon Bagalso , Dan Cunanan and May Sadsad of SB if it is possible to hold aBasketball game featuring the old guys. I too will be interested as a MIRON or spectatator. I qm over 70 and no longer agile. 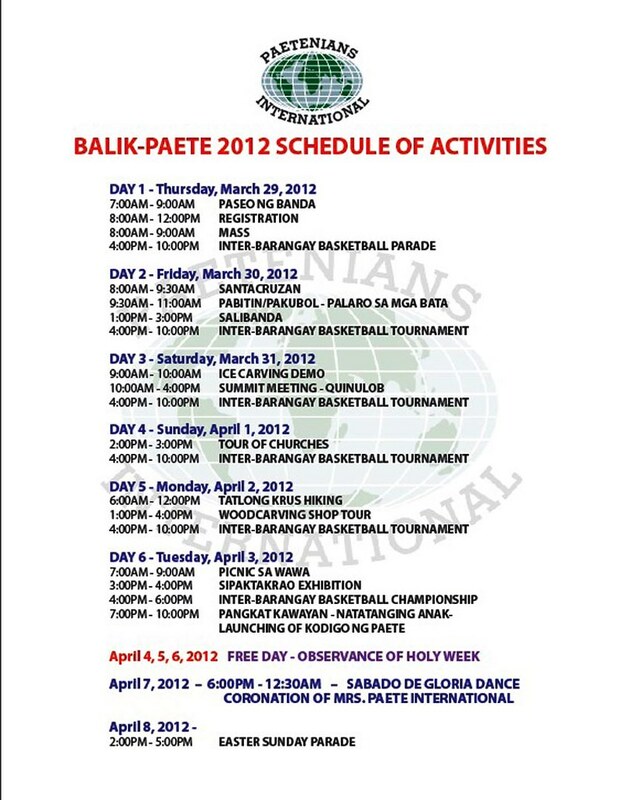 The original schedule is for the Championship to be held ion holy Tuesday 4:00 to 6:00 PM but I was told that there is a conflict with a catholic church activity, the championship has to be moved to Easter Sunday after the parade. If it is feasible and two competing teams of oldies can be assembled , the game can be scheduled just before the championship. What do you think DAn , May Simeon and Mayor? You dont really have to play the game, the mere presence and participating is to acknowledge the games and the fun we have seen in the old days, globetrotters style.Some younger players nowadays didn't know who you guys are.The mere intoductions of your(their names) will bring smiles to our kababayan. in Example. Dante V. center, stalwarth of the Raiders Team, considered the best player during his days. Boy Calabig, Alcanars, Jr. Cadapan, alcanars etc,etc. and two good referee that can bring comedy fun for our kababayan. Again tx a lot for your consideration. Noon panahon ng Alcanars ang champion ay Black Hawk hinawakan ng limang taon ang crown. at sumunod na taon ay ang millionaires. Iyang ang mga champion players. alamin ninyo ang mga players sa team nayon. Iyang ang magagaling na players. Bakit hindi ninyo imbitahin. Sila ay purong mga taga Paete players. guest di naman nagmamagaling hane,siguroy bata ka pa ng panahong yon,ang black hawk at millionaires ay mga kids ng panahon namin at ang alcanars at raiders ay nasa junior team, kaparis ng interwood,eastply,dribblers,gladiators,knights at marami pa.wag mamasamain hane?nagpapalwanag laang. Sayang I won't be there to join your festivities especially the proposed old-timers game. Just a little suggestions. Although it may be fun to watch the oldies play, marami sa atin ay probably out of shape na at with natural ailments. Pag real game kahit tatlohan baka may ma-heart attack. Instead of real game, you can still have shooting contests for seniors like what we do here at the YMCA every year. Mark 5-6 spots where to shoot twice, and the most number of points made wins Gold, silver, or bronze medals (or any prizes). You can have it divided by age bracket: 40-50, 51-60, 61-70, 71 and up. Basta nakakahagis pa ng bola puedeng sumali!